This is where we begin our photographic 'tour' of the BALLET MECANIQUE music rolls, old and new! Each of the illustrated pages is linked, at the bottom, so that you can move forward or backward through the series — or jump back to the Home Page for Antheil's music. 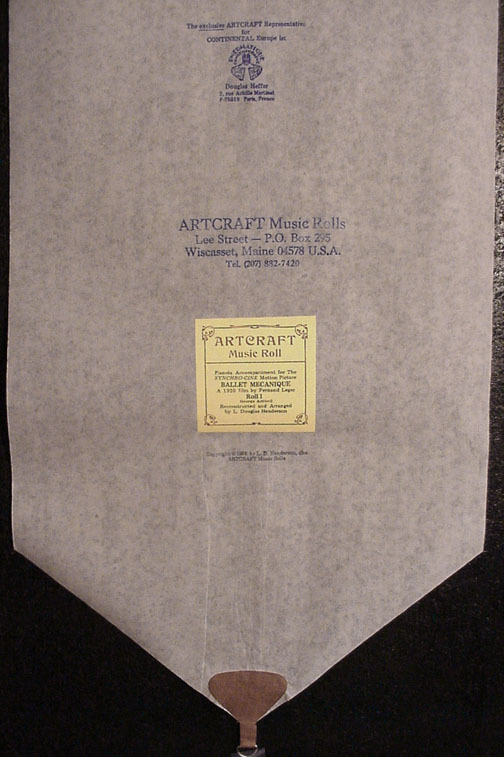 The ARTCRAFT Music Roll Set of 3 rolls, approximately 250 feet in length when combined, runs the projection time of the motion picture in its original form, and ... recent evidence has surfaced which indicates that there might have been 2 movies made in the 1924-1926 period of BALLET MECANIQUE being a Pianola+film experimental project. The key word is "experimental" since both the score and the motion picture were changed frequently, whereas the 1925 rolls by the Pleyel Piano Co. remained "fixed" in their perforated presentation. Thus, it wasn't long before the audio and the visual aspects of this combined effort between artist Fernand Léger and composer George Antheil went a different direction from photographer Dudley Murphy, artist Man Ray and others involved in these early Salon presentations. Hemingway discussed with the Murphys that the movie was supposed to have (quote) "French toughs and goggled industrial workers with steel girders" and the like ... something quite different from the truncated 'party' film of trick photography which exists today! Click on to the links before, and you'll be taken step-by-step through the 1925 and 1991 rolls of George Antheil's BALLET MECANIQUE ... in the form it was originally designed to be presented, with the Pianola as the solo instrument -- or the solo Player-Piano as the "heartbeat of the ensemble" as conductor Maurice Peress wrote arranger Douglas Henderson, shortly after the release of the "reconstructed" Interpretive Arrangement. From beginning to end, this music was written for the pneumatic Pianola, as you'll see while progressing from one illustration to another.